On July 11, 2012, a team of astronomers using NASA's Hubble space telescope announced the discovery of a fifth satellite orbiting this icy dwarf planet. Currently designated "P5" (or "S/2012 (134340) 1"), this latest moon is irregular in shape, ranging between 6 and 15 miles (10 to 24 kilometers) across. The new moon has a 58,000-mile- (or 93,000-km-) diameter circular orbit around Pluto, which is assumed to be co-planar with the other known satellites. Many astronomers currently favor the theory is that all of Pluto's moons are relics of a collision between Pluto and another large Edgeworth-Kuiper Belt object billions of years ago (Hubble news release). 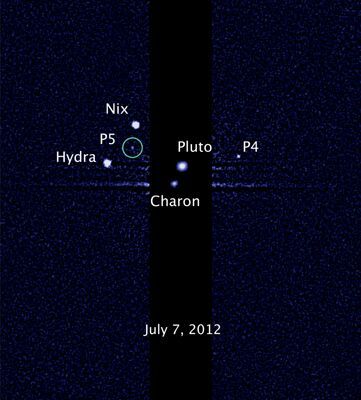 On July 20, 2011, astronomers working with the Hubble Space Telescope announced the discovery of a fourth moon around Pluto. Found in images taken on June 28, 2011, the object is currently designated "P4." This new satellite is the smallest yet found, with an estimated diameter of only 8 to 21 miles (13 to 34 km). By comparison, Pluto's largest moon Charon spans 648 miles (1,043 km) across, while the other two satellites discovered in 2003, Nix and Hydra, are 20 to 70 miles (32 to 113 km) wide. 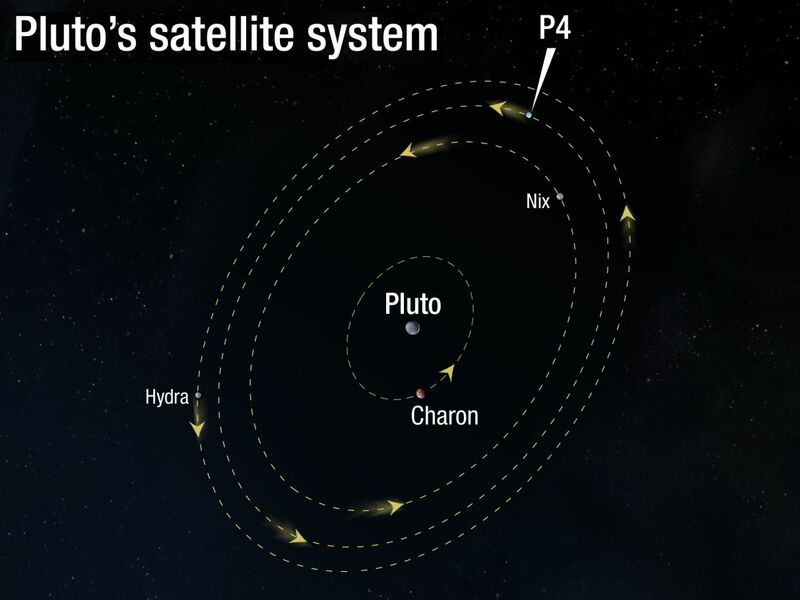 P4 moves between the orbits of Nix and Hydra and completes an orbit around Pluto roughly every 31 days. Its discovery supports the hypothesis that that all four satellites were formed during a massive collision 4.6 billion years ago. The astronomers found P4 while searching for rings or other potential hazards for NASA's New Horizons probe, which is due to pass through the Pluto system in 2015 (HubbleSite.org news release; NASA science news; Astronomy Picture of the Day; Alan Boyle, MSNBC, July 20, 2011; and David Shiga, New Scientist, July 20, 2011). Pluto is no longer the smallest, officially defined "planet" from the Sun. 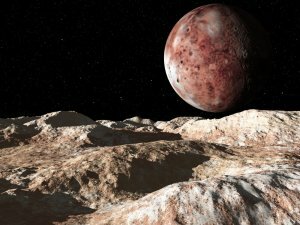 On August 24, 2006, the International Astronomical Union (IAU) voted to classify Pluto as a "dwarf planet," because it is not massive enough to clear its orbital neighborhood of similarly sized objects. Indeed, Pluto is actually smaller than seven satellites of the other planets in the Solar System -- Earth's Moon, all four of Jupiter's Galilean moons (Io, Europa, Ganymede, Callisto), Saturn's largest moon (Titan), and Neptune's largest (Triton). In 2005, moreover, astronomers finally discovered another Edgeworth-Kuiper object (EKO) called Eris which is currently estimated to be more massive but with roughly the same diameter as Pluto, whose diameter was revised in 2009 to be at least 1,453 miles, or 2,338 km (Emily Lakdawalla, Planetary Society blog, October 12, 2011; John Matson, Scientific American blog, October 12, 2011; Lisa Grossman, New Scientist, October 14, 2011; and Lellouch et al, 2009). Although Pluto is usually farther away from the Sun than any other planet, its orbit is highly elliptical ("eccentric"), and so Pluto is closer than Neptune for 20 years out of its 249-year orbit. As Pluto approaches its close approach to the Sun (at perihelion), it also reaches its farthest distance from the plane of the planets ("ecliptic") due to its orbital inclination of 17 degree, which is much higher than those of the other planets. Thus, Pluto is always far above or below the plane of Neptune's orbit, and so the two planets will not collide because they do not approach any closer than 18 AUs (18 times the distance between the Earth and the Sun) to one another. 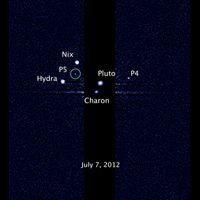 Pluto's period of rotation is 6.4 days, which is the same as its moon Charon. Although many other moons in the Solar System travel in a synchronous orbit with their planet, Pluto is the only planet to rotate synchronously with the orbit of its largest satellite. This means that they are tidally locked so that the two present the same face to each other as they travel through space. Like Venus and Uranus, Pluto actually rotates in the opposite direction (retrograde rotation) from most of the other planets. Pluto is locked in a 3:2 resonance orbit with Neptune (where its orbital period is exactly 1.5 times longer than Neptune's). Like Uranus, the plane of Pluto's equator is at almost right angles to the plane of its orbit. Pluto's surface temperature varies ranges from -228 to -238 �C (-378 to -396 �F) during the course of its orbit, as the planet gets as close to the Sun as 30 AU before swinging as far away as 50 AU. 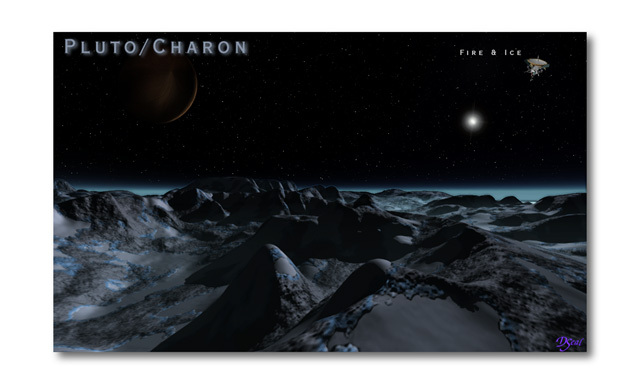 In January 2006, astronomers announced that Pluto is "colder than it should be" at 43 K (-382 degrees F) in recent observations -- significantly colder than its largest moon, Charon (Smithsonian press release). 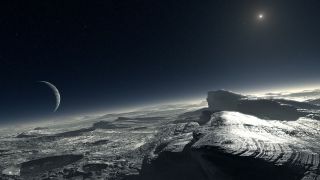 The finding agrees with the current model that the low temperature of Pluto results for the equilibrium between the planet's surface ice and its thin nitrogen atmosphere, not just from the weak sunlight received. Sunlight reaching Pluto's surface converts some of the surface nitrogen ice to gas with a cooling effect, rather than heat the surface, through a process similar to the way evaporation of sweat cools Human skin. closer to the Sun (more). The planet's icy surface is virtually all (98 percent) nitrogen, with some methane and traces of carbon monoxide. A bright highlight on Pluto suggests that it has a smoothly reflecting surface layer, and that there is a bright area parallel to the equator on Pluto. The bright areas seem to be covered with ices of nitrogen with smaller amounts of solid methane, ethane, and carbon monoxide. Darker areas may primordial organic material or the result of photochemical reactions driven by cosmic rays. 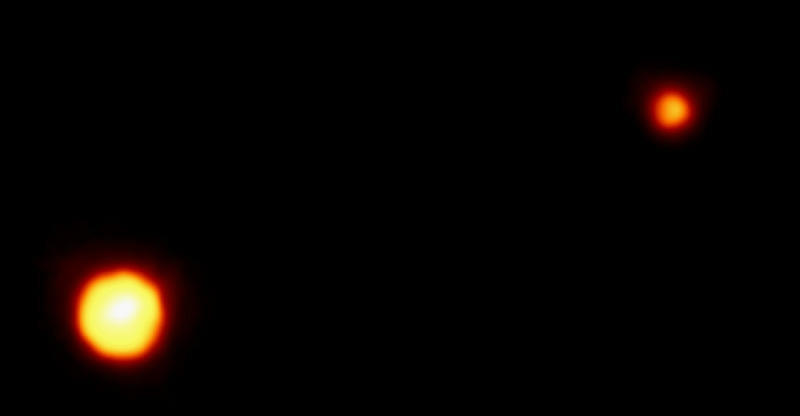 In general, Pluto is somewhat brighter and pinker than its moon Charon. 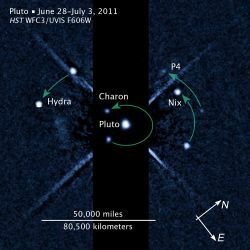 While Pluto's internal composition is unknown, Hubble Space Telescope observations suggest that the planet's density lies between 1.8 and 2.1 gm/cm3 which indicates that the planet is probably a mixture of 50 to 70 percent rock with the remainder being water and other ices much like Nepture's moon Triton. The planet probably has a thin atmosphere that freezes and falls to the surface as Pluto moves away from the Sun. Given the composition of its surface materials, Pluto's atmosphere probably consists primarily of nitrogen with some carbon monoxide and methane. It must be extremely tenuous since surface pressure is only a few microbars. 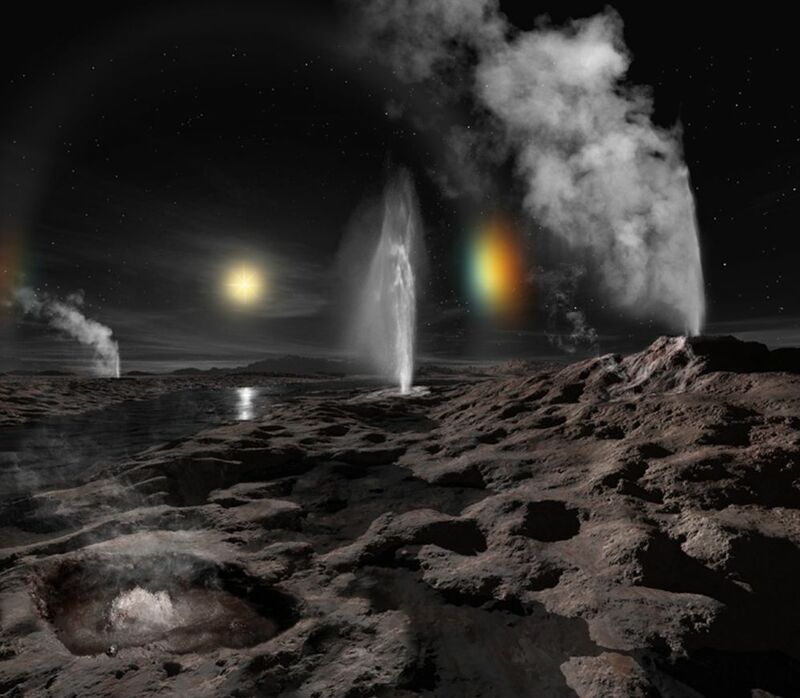 When Pluto is closest to the Sun (near its perihelion), some of the atmosphere's substance may escape into space and perhaps interact with its large moon, Charon. For most of Pluto's long orbital year, however, the atmospheric gases freeze into ice. Although Pluto was discovered in 1930, Charon wasn't detected until 1978 because the moon is orbiting so close to Pluto that the two worlds are usually blurred together when viewed through ground-based telescopes. 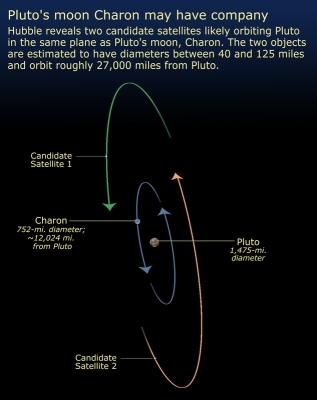 In 1994, however, the Hubble Space Telescope resolved Pluto and Charon well enough that astronomers were able to directly and more precisely measure Pluto's diameter as 2,320 km (1,440 miles) and about 19,640 km (12,200 miles) from Charon. In 2005, Charon's diameter was more precisely determined as between 1,207 and 1,212 km, 750 to 753 miles (ESO press release). � Association of Universities for Research in Astronomy, Inc. (AURA). All Rights Reserved. With a diameter between 750 and 753 miles (1,207 and 1,212 kilometers), Charon is the largest moon with respect to its primary planet in the Solar System. 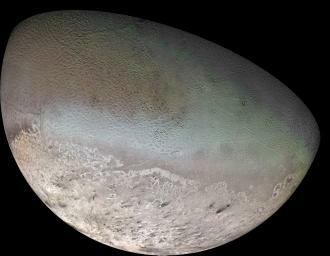 Its density is 1.71 times that of water, which suggests its icy contents are just more than 50 percent rock, and about 10 percent less rock by mass than Pluto. The moon probably does not have a significant atmosphere (ESO press release). 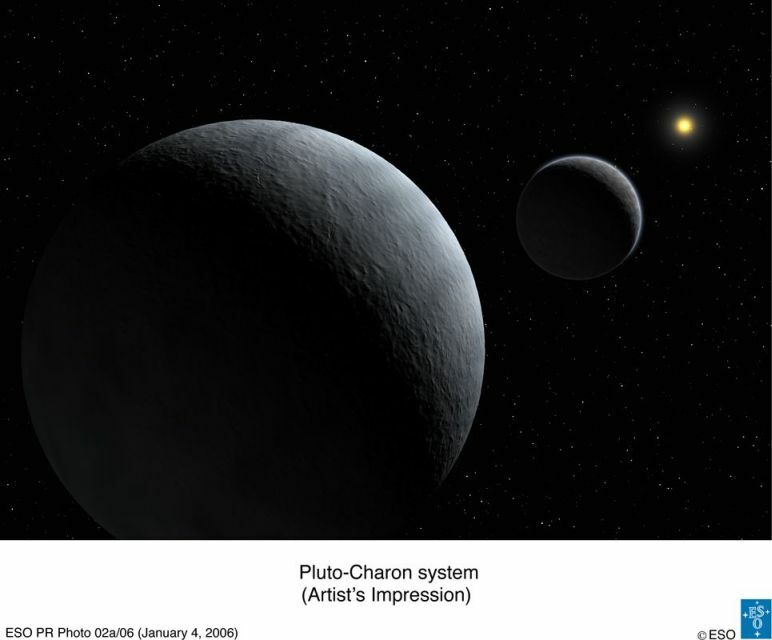 in a "naked eye simulation"
The unusual nature of the orbits of Pluto and Triton and the similarity their physical properties suggest that there may be some historical connection between them. It was once thought that Pluto may have once been a satellite of Neptune's, but this now seems unlikely. A more popular idea is that Triton, like Pluto, once moved in an independent orbit around the Sun as a Edgeworth-Kuiper ice body and was later captured by Neptune. Perhaps Triton, Pluto, and Charon are the only remaining nearby members of relatively large Kuiper Belt objects of which most were ejected into the Oort Cloud. On October 31, 2005, a team of astronomers (including Hal Weaver, Alan Stern, Max Mutchler, Andrew Steffl, William J. Merline, Marc Buie, Eliot Y. Young, John R. Spencer, and Leslie A. Young) using the Hubble Space Telescope announced their apparent discovery of two new moons orbiting Pluto, in addition to Charon (Hubble news release; latest news; and Stern et al, 2005). 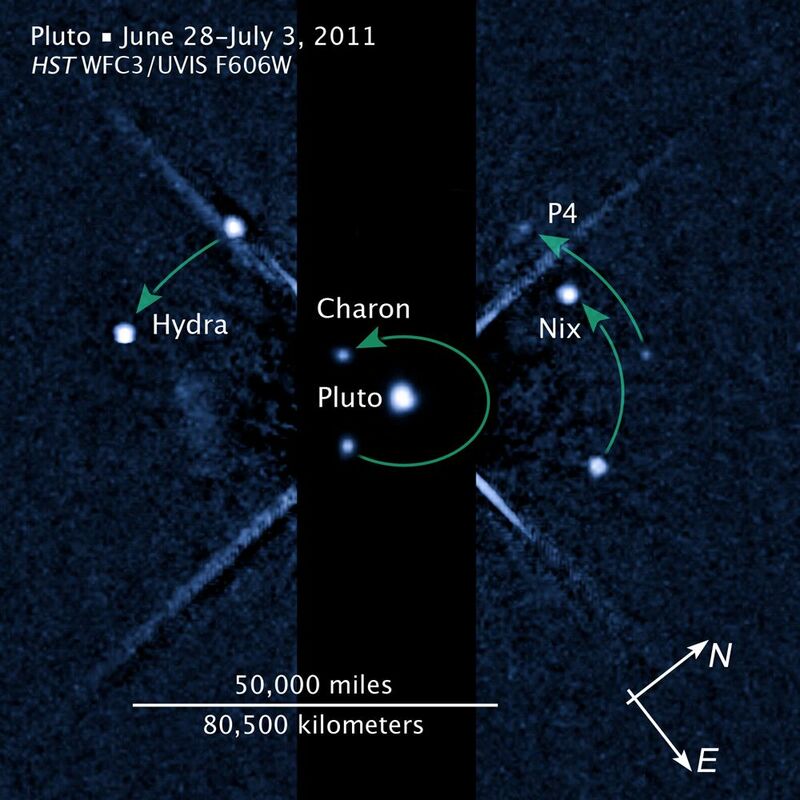 On June 22, 2006, astronomers associated with the discovery of the two new moons announced that the International Astronomical Union had approved the names of Nix for the inner satellite and Hydra for the outer one (press release and Astronomy Picture of the Day). Estimated to be around 40 and 125 miles (64 and 200 kilometers) in diameter, the two small moons orbit about 27,000 miles (44,000 kilometers) from Pluto, more than twice as far as Charon, Pluto's other satellite. 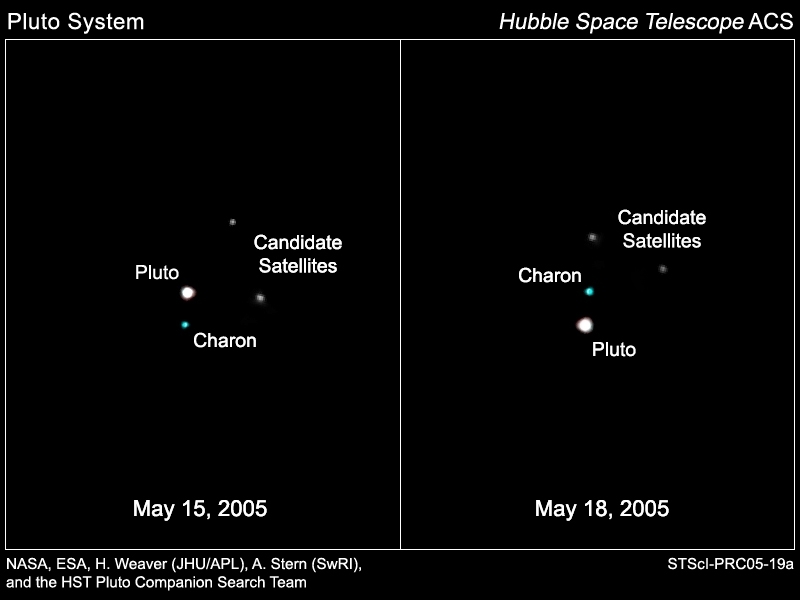 Provisionally designated S/2005 P1 and S/2005 P2, the moons are around 5,000 times dimmer than Charon. 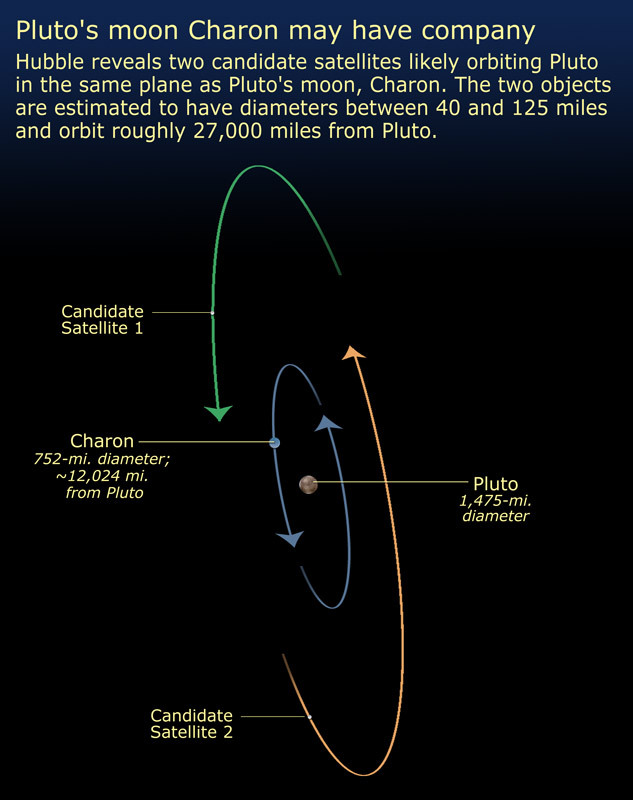 Initial observations suggest the new moons have circular orbits around Pluto in the same plane as Charon. The orbits of Charon and the two new moons appear to be in "resonance"; for every 12 times that Charon circles Pluto, P2 orbits three times and P1 twice. (More at hubblesite.org and at Astronomy Picture of the Day.) In February 2006, astronomers announced that they had confirmed the existence of the two new moons with the Hubble Space Telescope and speculated that the moons were created in the same collision that formed Charon (more from hubblesite.org and astrobio.net). 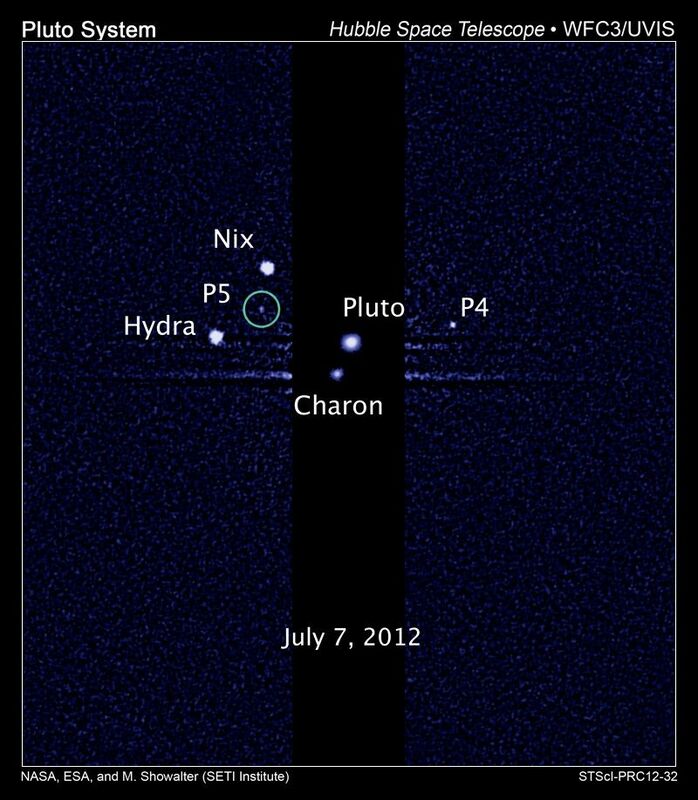 On June 22, 2006, astronomers associated with the discovery of the two new moons announced that the International Astronomical Union had approved the names of Nix for the inner satellite and Hydra for the outer one (press release and Astronomy Picture of the Day).